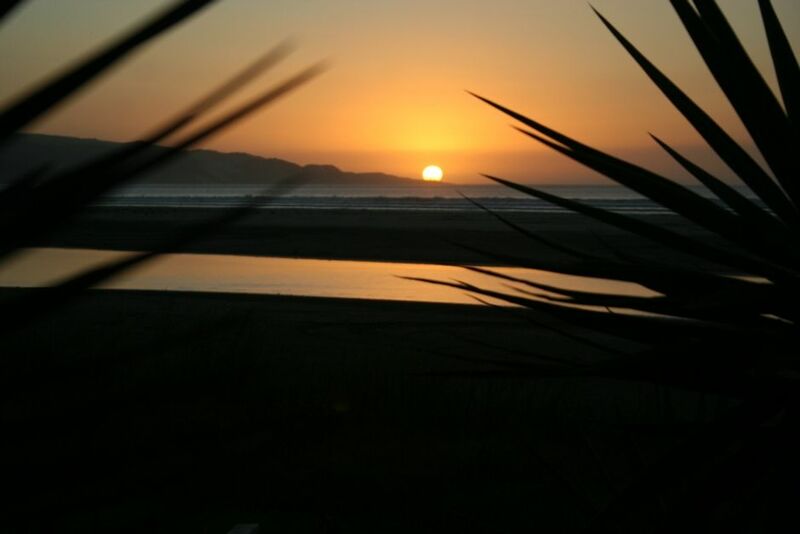 Ahipara Surf Lodge consists of 5 bedrooms and can accommodate up to 12 people with our 2 x triple share bunkrooms, 2 x twin room and a beachfront double room with en-suite. There are 2 other bathrooms, 2 lounges and wireless Internet. Outside you’ll find the BBQ, outdoor table and chairs and beach loungers. We also have an outdoor shower and fish-filleting plenty of off-street parking for the boat. We cater for small groups (couples) right up to large groups (sleeping 12). Ahipara is located at the southern end of 90 Mile Beach on the west coast of Northland New Zealand. The climate is subtropical, the sunsets are stunning and it is home to one of the best left hand surf breaks in New Zealand. Our beachfront lodge has a wonderful homely feel to it and it is a great spot for surfers and families to stay and relax. The house is set amongst a tropical garden and a private stairway from the lawn leads you straight down to the beach. The evening sunset BBQs are the highlight of everyone’s stay and we'd love to share this 'kiwi beach house' experience with you. If you are here to surf then directly in front of the lodge is a very good consistent beach break that offers perfect learning and long boarding waves. We can also organise surf lessons if needed with local SNZ registered surf coaches. If surfing isn't your thing then take your pick from a number of other activities on offer; fishing – surfcasting from the beach (also in front of the house), swimming, kite boarding, windsurfing, golf, sand-boarding, beach walks, or head up to Cape Reinga for the day on a bus tour or self drive. There is something for everyone in Ahipara so come and check out this piece of paradise. ** Please note our rates are $100 per night (for exclusive use of the lodge) which includes up to 2 people (min 2 night stay) making the house more affordable for smaller groups. Additional people are $50 per night for up to 12 guests total. Kids under 5 stay free. We welcome guests who will respect our house, our belongings and also our neighbours. What a great place, clean, sunny and loads of room for everyone. The bach is right on the beach with a magnificent view of 90 Mile beach. Swimming, sunsets, huge out door table, BBQ, large kitchen, comfy beds, 3 bathrooms, everything we needed for a relaxing few days. Would recommend to anyone and we'll definitely be back in the near future. Thanks for sharing with us. Slightly older property set up for surfers! Great for a couple though with very reasonable rates. Very responsive host and fantastic ocean views. Love this place - we will be back!